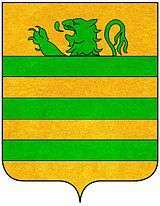 The House of Ordelaffi was a noble family that ruled the lower Romagna from the 13th century to 1504, with some interregnums. The Ordelaffi origins are unclear, but themselves claimed a lineage with "Lor de Laffia", a Germanic soldier under service to Berengar I of Italy in 889. He was appointed as governor of Forlì, that starting to rule itself as free commune. In 910, Lor de Laffia attempt to conquer the city, but was exiled to Ravenna. His heirs were surnamed as "Lordelaffi", "Ordelaf" and finally "Ordelaffi". In 13th century, the Teobaldo Ordelaffi conquered Forlì, make it in a Ghibelline stronghold. Teobaldo was near to the Emperor Frederick II, besiege with him Ravenna and Faenza. For compense, Frederick II appointed officially Teobaldo as Signore of Forlì. The son of Teobaldo, Scarpetta Ordelaffi, starting a war against the Republic of Florence in 1302, with the support of the "White" Guelphs, led by Dante Alighieri. In 1303, Scarpetta fought with the podestà Fulcieri da Calboli for the control of Forlì. Finally, the Calboli lost and the Ordelaffi expelled them from the city. Laterly, Scarpetta conquered Bertinoro. The brother of Scarpetta, Francesco I Ordelaffi, succeded him to rule Forlì, make alliance with the House of Montefeltro against the House of Malatesta, Guelph family that ruled Cesena and Rimini. Francesco II Ordelaffi, nephew of Francesco I, lost the power when Cardinald Albornoz was appointed tho re-establish the papal's order in Romagna, in 1356. Surround by enemies, Francesco II lost first Faenza, then Cesena and Bertinoro in 1357. Francesco II tried to emply the Great Company's mercenaries, bu Albornoz recruit them first. Defeated, Francesco II was expelled from Forlì and gain only Castrocaro and Forlimpopoli. In 1376 Sinibaldo I Ordelaffi re-conquered Forlì and its territories but was poisoned by his nephew Pino I Ordelaffi, that laterly also poisoned Sinibaldo's son Giovanni in 1399, for gain Forlì for himself. This murders were the decline's start for the Ordelaffi, like the other Pino's successors ruled for few time Forlì. In 1425, after the death of Teobaldo II Ordelaffi, Forlì passed under the Diocese's control. In 1433 Antonio Ordelaffi restored the signoria, but the Ordelaffi were expelled from Forlì by Pope Sixtus IV, who appointed his nephew Girolamo Riario as Lord of Forlì and Imola. In 1503, Cesare Borgia, who was styled "Duke of Romagna" only two years once, and his family lost their power in the Papal States and Antonio Maria Ordelaffi gain another time the control on Forlì. However, only a year later, Antonio Maria die without son, ending the Ordelaffi family. Arms of the Faliero family. However, other descendants of Lor de Laffia moved to the Republic of Venice, and changed their surname in "Faliero" or "Faledro", the inverted form of "Ordelaf". In Venice, the Faliero branch became powerful and had also two doges in the early 12th century: Vitale Faliero (1084–1095) and Ordelafo Faliero (1102–1117). In 1211, the Falieros were the first Venetian settlers in the Duchy of Candia (now Crete), starting a profitable trade with the other Mediterranean states. The family's decline began in 1355, when the Doge Marino Faliero try to realise a coup d'état in Venice and establish a monarchy, but failed and was decapitated. Also if there were other important Falieros, they never expressed a Doge again and at the end of the 14th century the family disappear. ↑ Alma Poloni (2013). "Ordelaffi, Scarpetta". Treccani. ↑ Dino Compagni (1726). Cronica delle cose occorrenti ne' tempi suoi. ↑ Alma Poloni (2013). "Ordelaffi, Francesco di Sinibaldo". Treccani. ↑ Paolo Bonoli (1826). Storia del Friuli. Bordandini. p. 122. ↑ Irmgard Fees (1994). "Falier, Vitale". Treccani. ↑ Giuseppe Tassini (2009). Curiosità Veneziane. Filippi Editore. pp. 241–242.